Mystery Plants in my Garden!? Hi! I'm new here, been gardening all my adult life, love it, and guys (& gals, lol) - The Old Silly is stumped! I set these plants out in mid-May as 2" tall little seedlings. The seeds came out of a jalapeno pepper packet, but they are clearly NOT peppers! 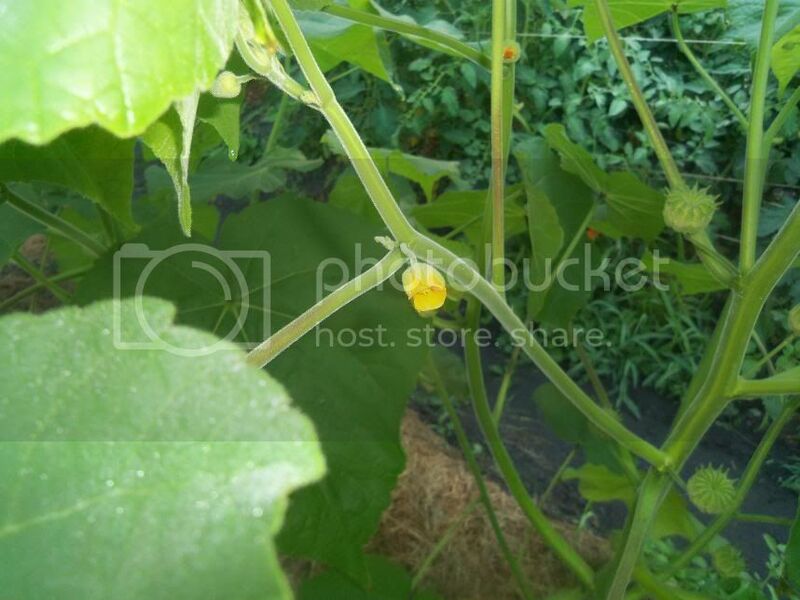 Over 4' tall now, with large, broad leaves that are velvety to the touch, the plant produces small yellowish-orange blossoms and fruit? seed pods? dunno ... roundish, flat-topped, about nickle to quarter size in circumference, light green in color, sort of husky outside - almost looks like a cousin of the tomatillo, but ... I've Googled my brains out and cannot find what they are? Anyone out there able to ID these guys for me? "velvety leaves" is the clue. It is called ... can you guess... velvet leaf. It is a wildflower/ weed. It got started in my yard from a packet of mixed wildflower seeds. Most of the rest of them died out, but the velvet leaf has spread itself all over my yard. It spreads freely but not aggressively and is easy to pull if it pops up somewhere you don't want it. It will get 4' tall or so if you leave it. I make sure to leave some, because it is a great trap crop for leaf miners, which love those soft leaves and congregate in it in preference to anything else. Just pull off and dispose of the leaves that get leaf miner tracks in them. Elizabeth, thank you so much! A "Velvet Leaf" hmm? Cool. And you know what, I have seen leaf minors congregating (and copulating!) on the leaves, munching and eating holes in the plant's beautiful leaves. So ... it is yes, another of God's wonderful creations, with a tremendous value. Great. I'll save some of the seeds and use them each year as an adornment and helpful contributor to my garden. Hugs, Liz - so you are a Quaker? I am a spiritualist Christian, and do admire the tenants and practices of the Quaker faith. Take care, my friend, and thanks again. I am a Quaker, but I'm not Elizabeth Watson. She's a (relatively) famous (among Quakers) Quaker lady and that's a quote from her. I guess I should put quotation marks around it. Hadn't thought about that, but I see now that I should have. Will fix! Here's a link to some booklets she wrote. The Healing the Earth one is where the quote comes from. I was there when she gave that speech. The leaf miner goes through six stages, namely egg, three larval stages, pupa and adult. The adult leaf miners are small, yellow and black coloured flies. The larvae form mines in the leaves of plants. Pupation takes place mostly in the soil. So the larvae are mostly inside the leaf where you don't see them. Then they drop out, burrow into the soil, form pupae and emerge as little flies. Don't know what it was you were looking at.